There’s been a lot of talk about self care recently. While it may sound super indulgent at first glance what with all the emphasis on ‘me time’, it is an essential part of physical and mental health. If you’ve ever felt like you have nothing left to give, like you’re emotionally and physically exhausted, or even like you just need a moment to get away, you already know how important self care is for you and everyone else around you. There is no shame in hitting the reset button. There’s no shame in trying to keep all the cogs and wheels in your mind and body running as smoothly as possible. That’s essentially what all this ‘me time’ talk is hinting at. There’s no one-size-fits-all method for self care. Sometimes it’s as simple as lighting a candle and meditating. Sometimes it’s as painful as confronting the obstacles that we put in our own way. Whatever method of self care we choose, the fact of the matter is, we just need to find the rituals or habits that allow us to be our best selves. The mind and body are inextricably connected. We have to nurture both. Here are 3 suggestions for self care that you can incorporate today! As a coffee drinker, I completely understand if you hesitate on this one, but if I can do it you can too! 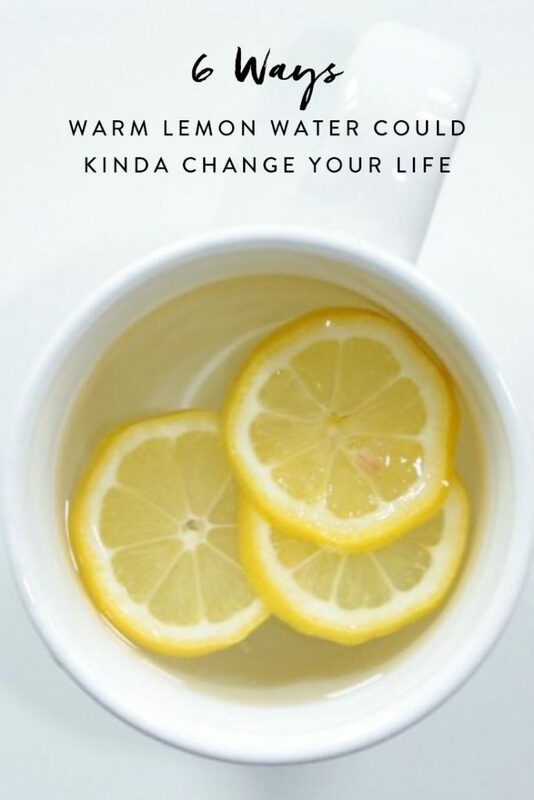 Warm lemon water, detoxifies and hydrates the body, aids digestion, and gives you a nice kick of Vitamin C. Just squeeze the juice from a fresh lemon into a mug of warm water and enjoy. I used to think journaling was something you did just to vent out deeply repressed frustration. Not so! There is so much to be thankful for and sometimes we lose sight of it. 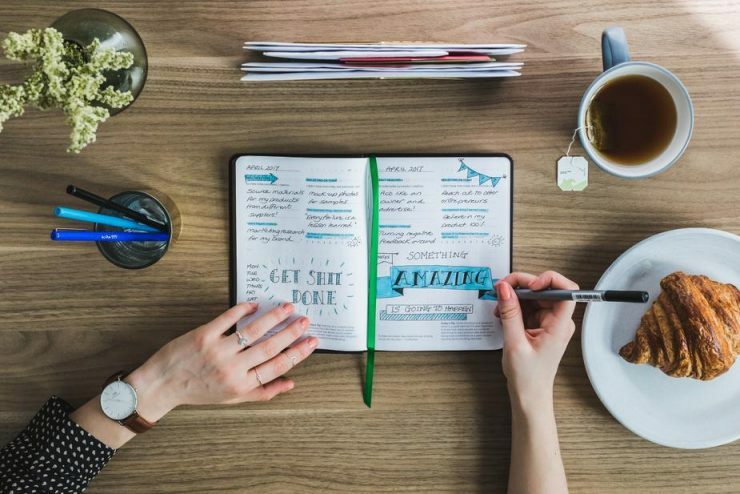 Each morning, take a few minutes to jot down a quick list of things you’re grateful for to kick the day off with a positive frame of mind. 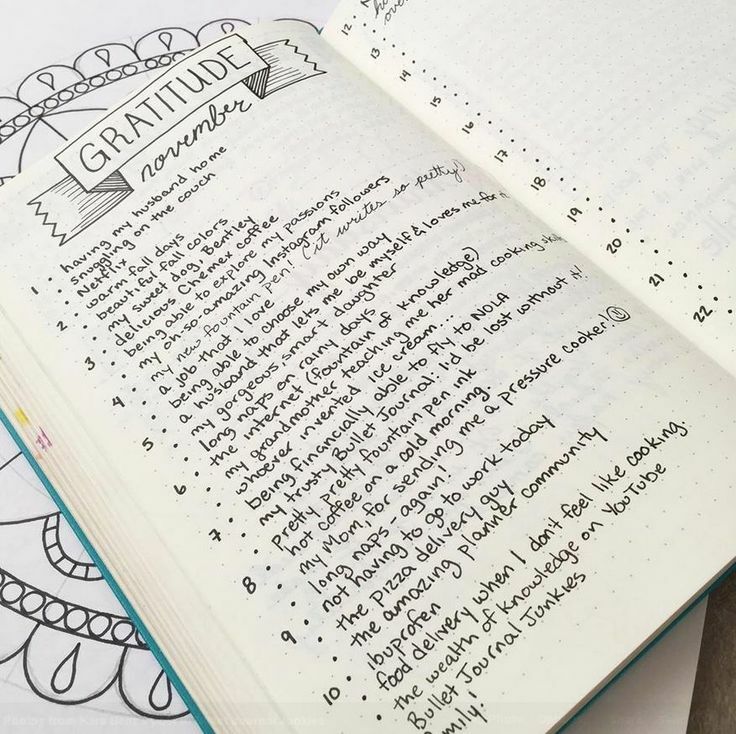 Seriously, a gratitude journal will remind you to be happy and keep you grounded. Oil pulling is an ancient Ayurvedic tradition that is primarily for oral health, but is also known to vastly improve overall health. Oil pulling is said to boost energy, clear up the skin, alleviate headaches, and much more. 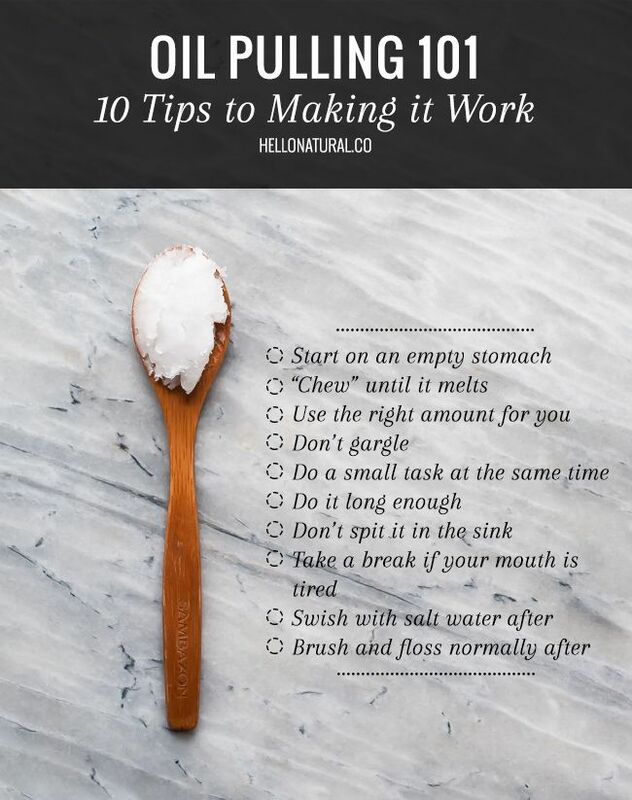 Swish a tablespoon of organic coconut oil in your mouth for 15-20 minutes first thing in the morning. Spit it out in the toilet or in the garbage to avoid clogging your drains. Rinse your mouth out and start your day! 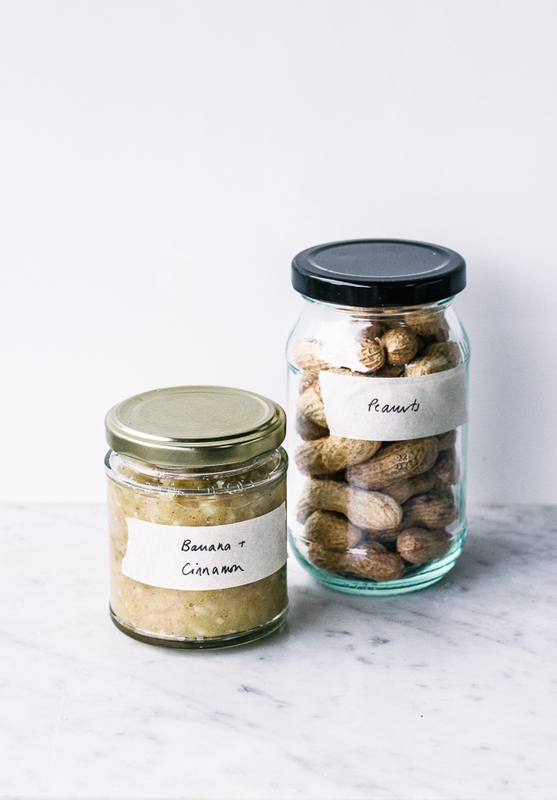 This is another Ayurvedic tradition that has a ton of benefits. 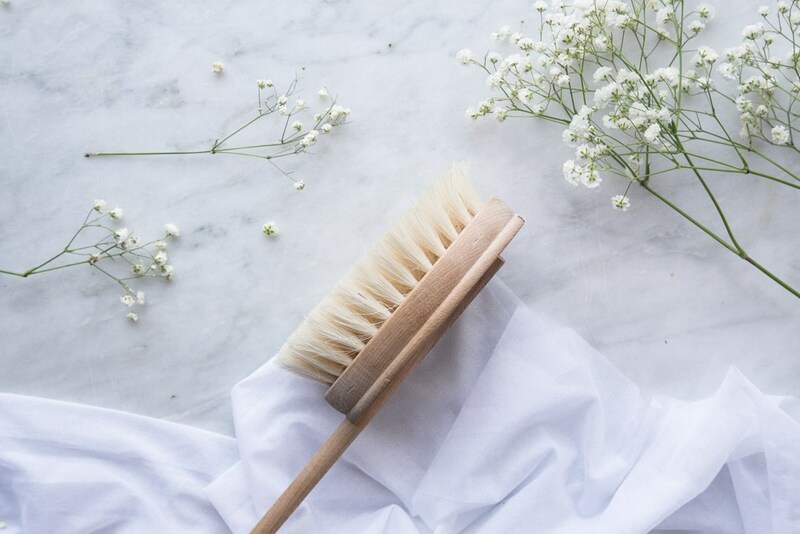 Not only does dry brushing stimulate the lymphatic system, it promotes detoxification, improves circulation, and you guessed it, it exfoliates your skin. Using a brush with natural bristles take an extra few minutes before your regular shower routine to dry brush. Beginning at your feet, gently brush in upward strokes working your way up toward your heart. Shower as usual. You’ll totally feel the difference. Again, there is no right or wrong blueprint for self care. Don’t hate on yourself if you’d rather take a bubble bath than do any of the things on this list. Find what’s right for you and start today! Your future self will thank you. Does running away from my problems count as cardio? Sigh. If only that was the way things worked. Anxiety and stress are no joke. No matter what changes you make to your diet and your fitness routine, your mind can always find a way to convince you to be miserable. Now that self care is an actual trending topic, we can finally openly talk about the struggles we’re facing in our quest for emotional and mental well being. What’s even better is that there’s always an app for that. This app goes beyond just general relaxation meditations. Meditation studio offers a wide variety of guided meditations that focus on specific areas like anxiety, sleep, and gratitude. 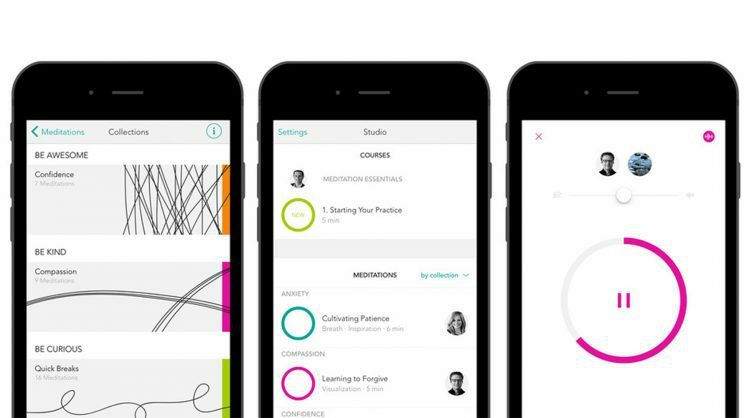 There’s even an ‘unguided’ feature that allows you to create custom meditations. 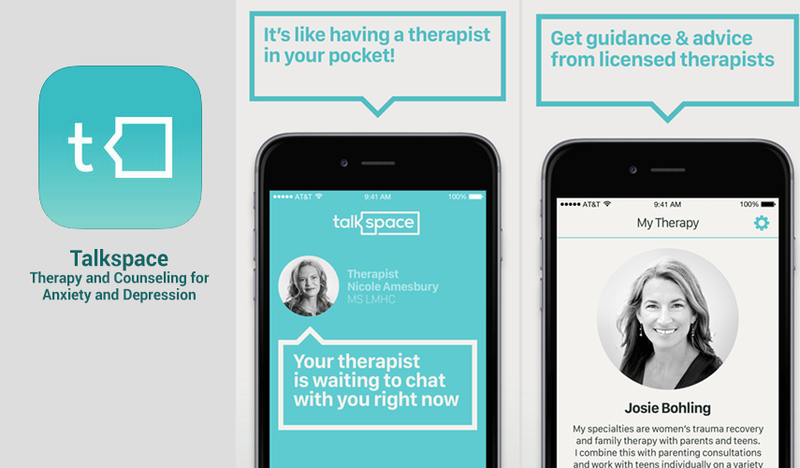 This app is like having the magical ability to get your therapist to make a house call. For $32/ week, you can chat with a professional as much as you need to. You can even do couples therapy! This is unlimited, on-demand counseling, y’all. 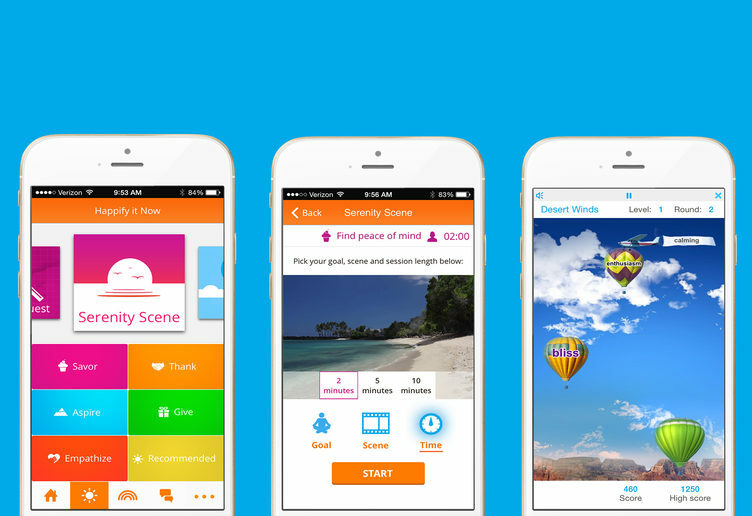 This app is like a one stop shop for emotional and mental support. Happify describes its mission best: “How you feel matters. 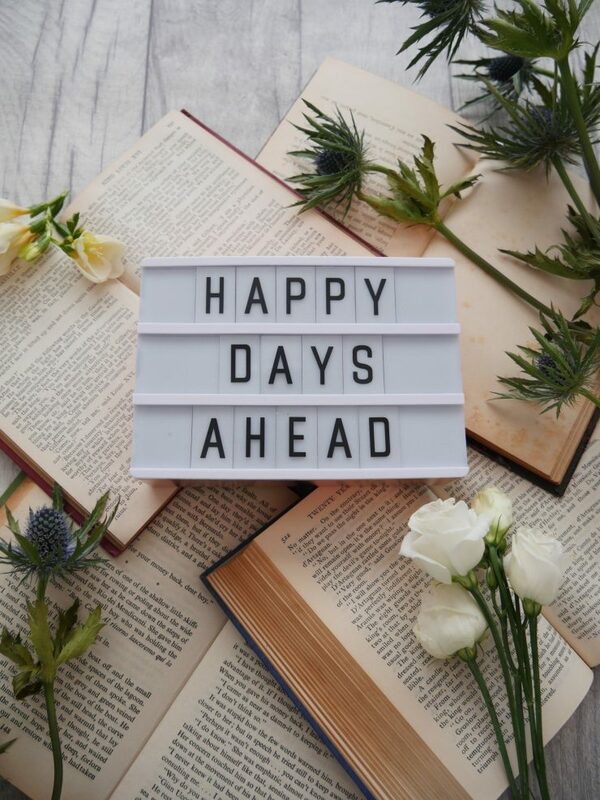 Whether you’re feeling stressed, anxious, depressed, or you’re dealing with constant negative thoughts, Happify brings you effective tools and programs to take control of your emotional well-being.” Set your goals and let the app do the rest. ***Didn’t find exactly what you’re looking for? Go here for the low down on more Health & Wellness Apps available on ios and android. I had a major crush on this boy that was way into Tai Chi and who (spoiler alert) turned out to be a totally self important tool bag. Considering he was so wrong about so many things, I started to firmly believe that Tai Chi is ridiculous because, ya know, there’s no “I” in denial. But with the new year comes the opportunity to restart, rejuvenate, and reinvent yourself. Even though I’ve come to see the practice of Tai Chi as a reliable red flag as any, this new year is already telling me otherwise. Tai Chi classes have already started making their way into a gym or park near you. Alas, this low impact exercise is perfect for reducing stress and creating calm in both mind and body. Still bitter. I probably need to work on that. Wellness is all about mind, body, and soul, right? 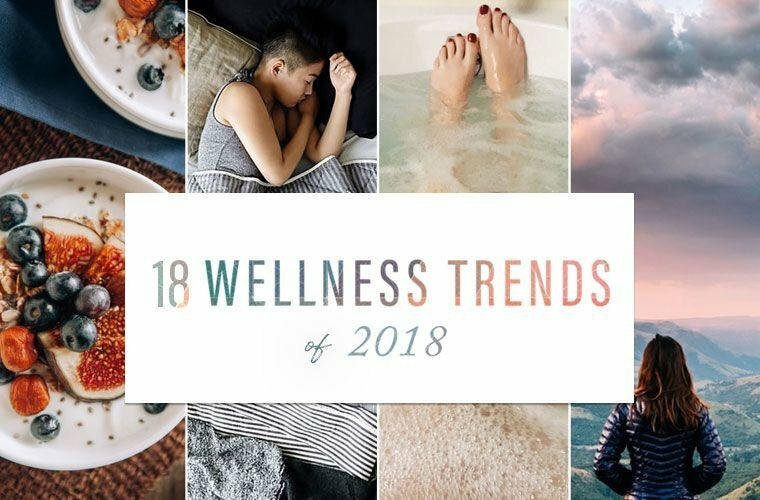 So, what else is 2018 bringing into the world of wellness? Here are just a few things that we’ll be seeing more of this year. As world leaders continue to compare missile sizes, and pretty severe weather patterns are devastating entire regions, we can’t help but notice environmental effects on our overall sense of wellness. Clean water has been a concern for decades, but this year, expect to see more talk about indoor air purification. After you painstakingly planned your diet and really got yourself into a successful workout routine, breathing in the comfort of your own home should be a no-brainer. Sadly, dust, mold, and other pollutants have been putting a strain on that otherwise quiet existence for some time now. 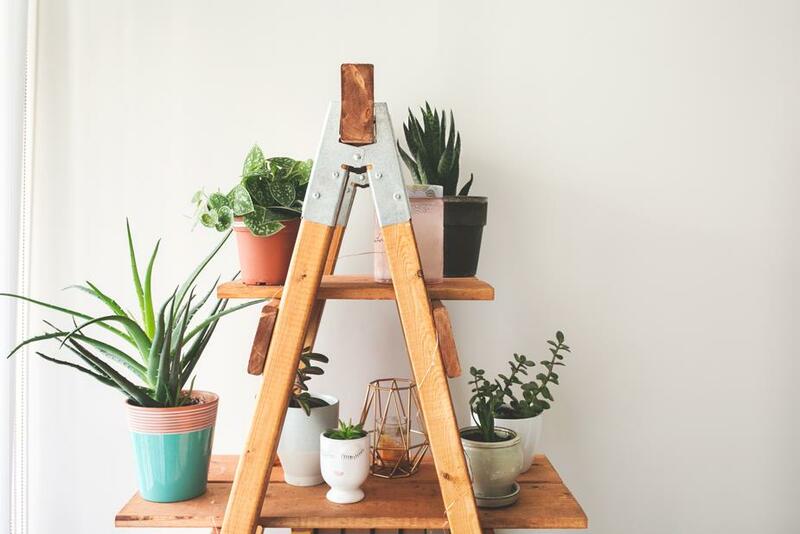 Searches for air purifiers and air purifying household plants have already increased by nearly 300% and we’ve only just begun. Fortunately, there are some pretty awesome air purifiers available on amazon. For larger spaces in your home, this tower-style HEPA air purifier with a charcoal filter is a workhorse, clearing the air of allergens and odor from pets and smoke. For smaller spaces, like your bedroom nightstand, this cute purifier will filter out 99% of the allergens in the air. Best part, they’re extremely affordable. Mindfulness in meditation has been trending for a while now. The idea is to be present in the moment and gradually let go of the thoughts that produce anxiety and adversely affect our mental well being. This trend is going to have some company this year as self-care becomes more and more important. 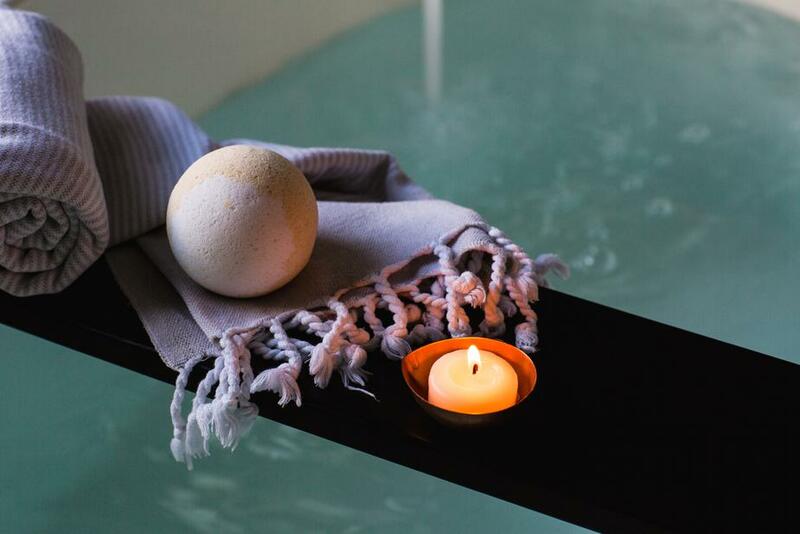 Whether the emphasis is on caring for your body through restorative post workout stretches or snacks (Huel and Althletic Greens have been my saving grace), getting enough sleep, or slipping away into a spa-like bath, the principle of self care is no longer a luxury. This year, it’s a necessity. From athletic gear, to women’s health, to brain-boosting supplements, to craft Kombucha elixirs, to gut health, and beyond. Those trailblazing folks over at Well+Good have rounded up their Top 18 Trends of 2018. It’s so worth the read. I don’t know about you, but bio-hacking and high-tech sleep sound uh-mazing! Let’s all go ahead and try to forget the fact that ‘Men in Kilts Doing Yoga’ would make a pretty rad 80s band name. Let’s also try to forget that the music in the clip, though not 80s style awesome, is totally savage. We gotta focus here on what’s important. This right here is video proof of my working theory that kilts just make everything better. I don’t know about you, but I am totally inspired for today’s workout! Thanks again, Scotland!!! Finlay is the founder of Heart Space Dundee, providing specialist services to all sectors of the community specialising in work with children, special needs, disability, injury and cancer rehabilitation. Finlay is a Certified Forrest Yoga Teacher and has assisted Ana Forrest in Peterborough, working closely with her on adjustment and energy work. Finlay came to Yoga for his own rehabilitation after surgery on his legs and uses his experience, knowledge and sensitivity to work with people with complex physical needs. He continues his education through a daily Yoga practice and study of biomechanics and functional anatomy. Finlay is equally passionate that radiant health comes not just from posture, but from managing scar tissue through bodywork, processing emotionally through Forrest Yoga, and eating nourishing, nutrient-rich foods in as whole a form as possible. This rule of four (posture, scars, emotion, nutrition) defines his daily practice and passions. Finlay offers bodywork sessions and private Yoga sessions to help you achieve radiant health and can offer guidance on various ways to achieve your goals. I make it a point to eat yogurt everyday. Yogurt has so many health benefits! Everything from weight management, to digestive health, to healthy skin, nails, and hair, yogurt does it all. I’ve had my fair share of health concerns and yogurt has seriously regulated my system. I love yogurt, but in keeping with my quest to decrease the amount of sugar I consume, I’ve been paying special attention to the amount of added sugar in popular yogurt brands. Surprisingly enough, some yogurt brands have more added sugar than ice cream! Double U, Tee, Eff! As for me, I’ve settled on Siggi’s yogurt which is totally amazing and has just 8 grams of added sugar as opposed to some of the brands that have over 30 grams per serving. Everytime I go to the store, I stock up on Siggi’s. In fact, if after reading this post, you go to the store and there’s no Siggi’s left on the shelf, I apologize in advance because it was probably me that bought them all… Also, If you happen to see Siggi vacationing on the French Riviera, or some beautiful tropical island, you can tell her that I said you’re welcome. I’m pretty sure I’m financing that trip. As absolutely wonderful as yogurt is, I admit it can get a bit boring when you eat it Every. Single. Day. 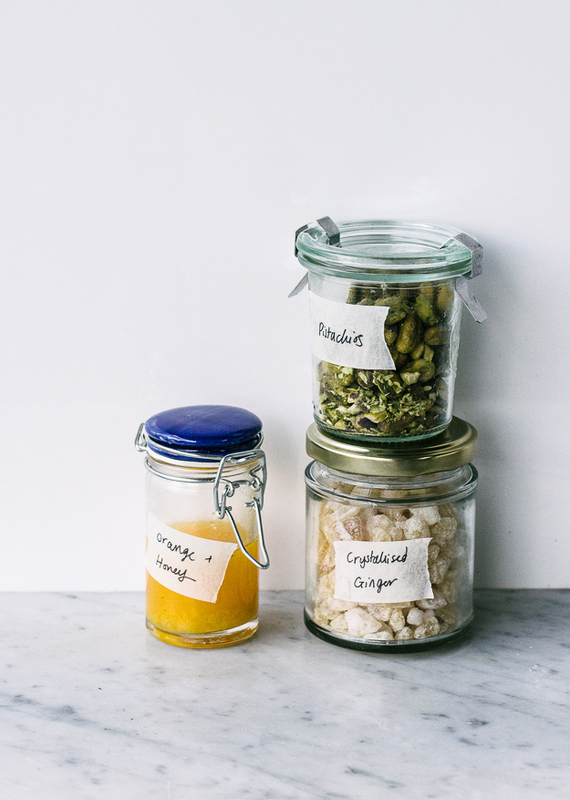 That is unless you have an arsenal of add-in ideas to take your yogurt from drab to fab! This is seriously the list to end all lists of yogurt toppings. I have tried every single one of these bad boys and let me tell you, these toppings take yogurt to a whole new level. Guilt-free, fine-yogurt-dining, y’all! You must try these! 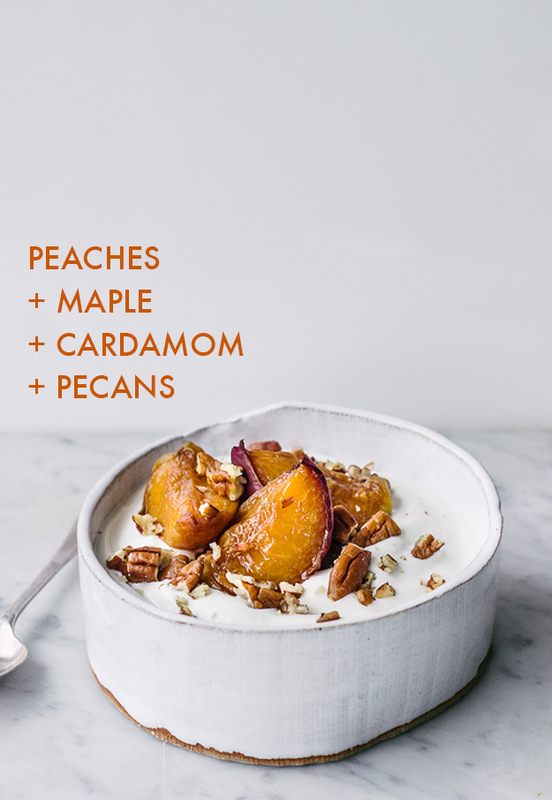 Toss together pitted and quartered peaches with a pinch of cardamom and drizzle of maple syrup. Roast in 350°F oven until tender. 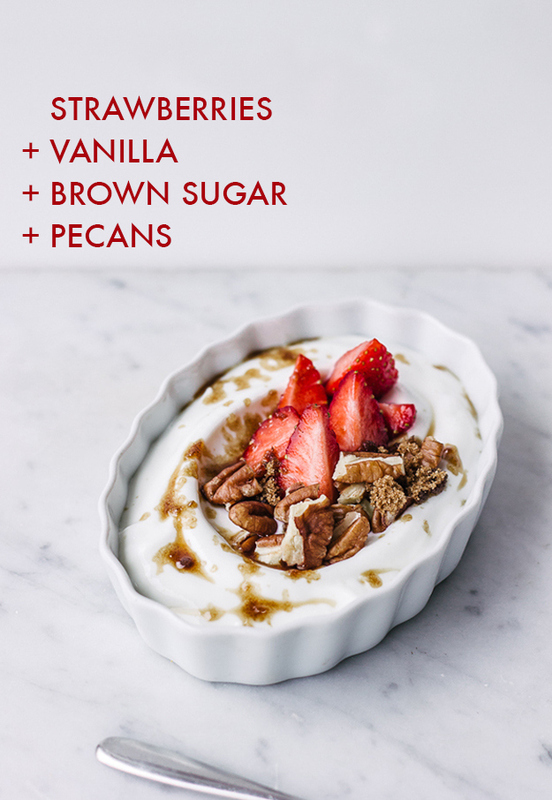 Eat warm or at room temperature over yogurt with chopped pecans. ***Roast extra peaches and keep refrigerated in a sealed container so you can use them throughout the week. Coarsely grate carrots and toss with honey and cinnamon. 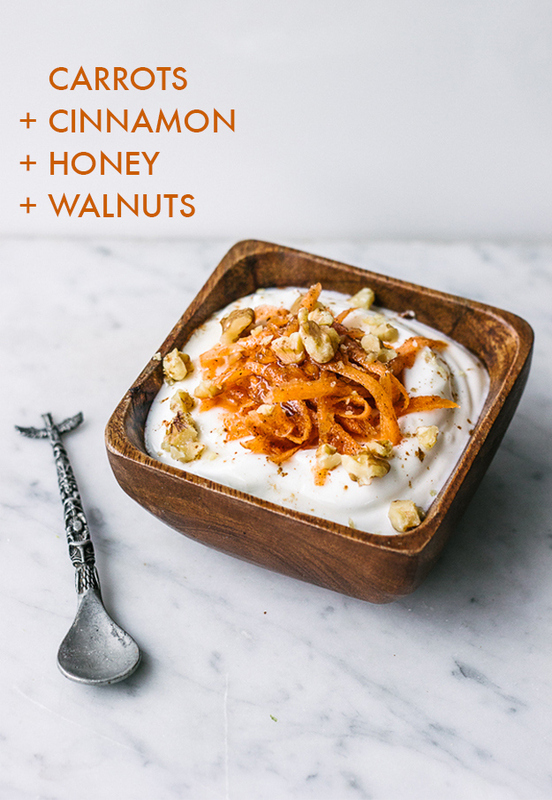 Spoon over yogurt and sprinkle with chopped walnuts. 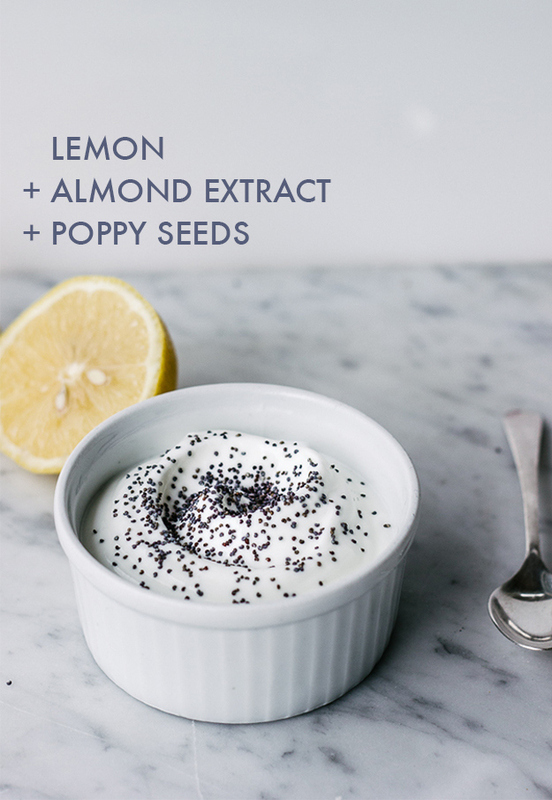 Stir lemon juice and a dash of almond extract into yogurt. Sprinkle with poppy seeds. 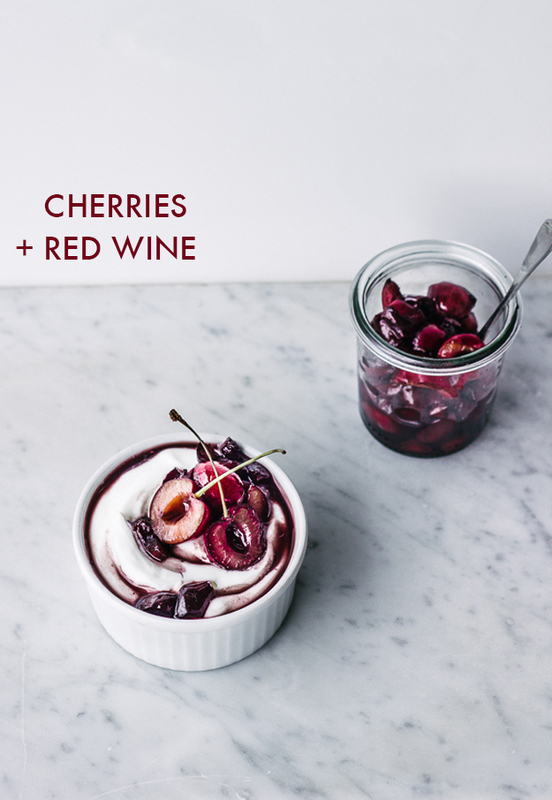 Pit and coarsely chop cherries. Add to a saucepan with a few tablespoons of full-bodied red wine and a pinch of sugar. Simmer until the liquid is thickened, then cool and serve over yogurt. 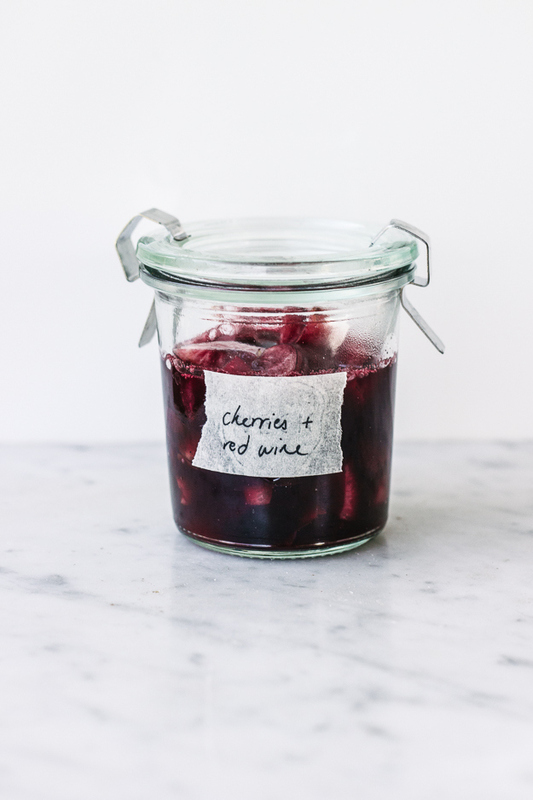 ***Cook extra cherry-wine sauce and keep refrigerated in an airtight container so you can use it throughout the week. Whisk together honey, orange juice, and orange zest. 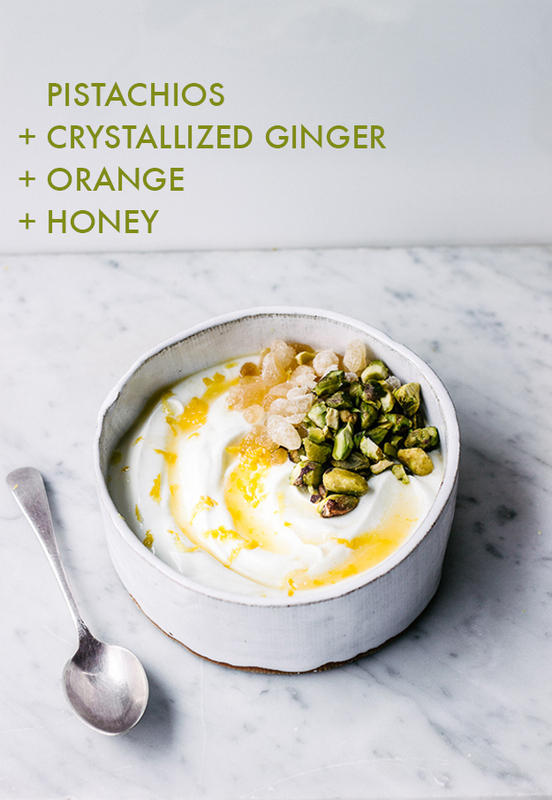 Drizzle over yogurt, and sprinkle with chopped crystallized ginger and chopped pistachios. ***Make extra honey-orange sauce and keep in the fridge in an airtight container so you can use over the next few days. 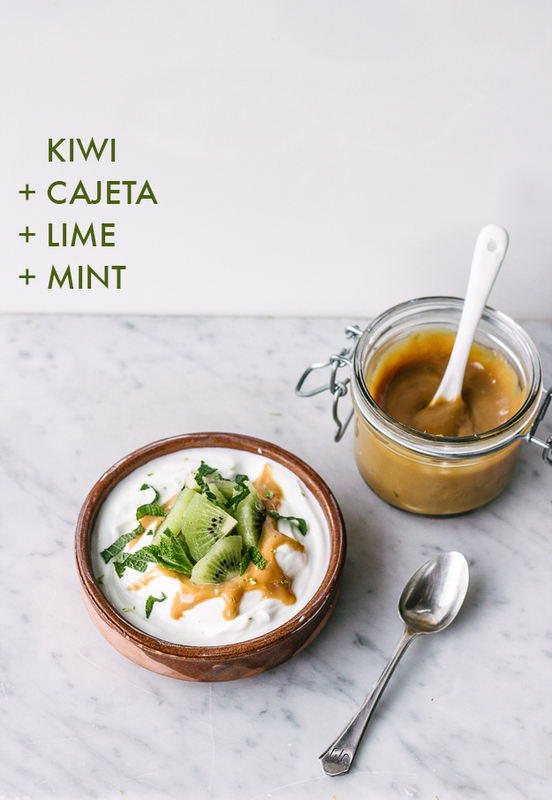 Swirl honey into yogurt. 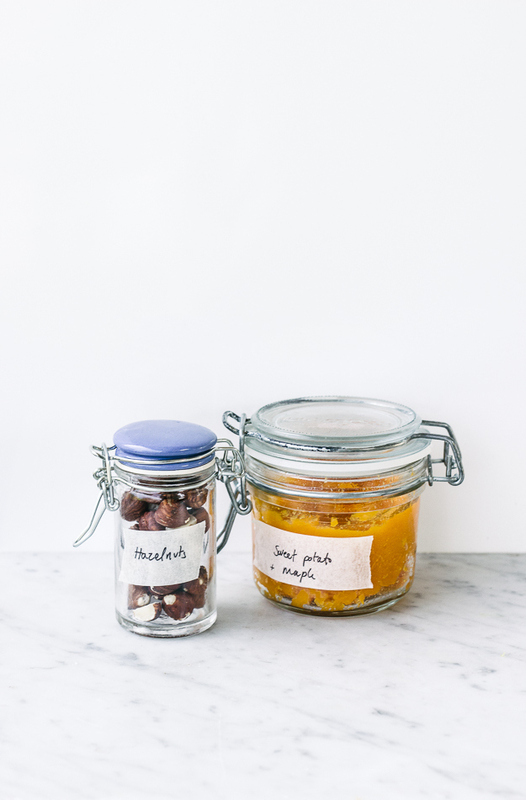 Top with coarsely chopped almonds and apricots. Drizzle with additional honey. Wrap whole sweet potatoes in aluminum foil and roast in a 375°F oven until tender. Peel and mash with a drizzle of maple syrup. 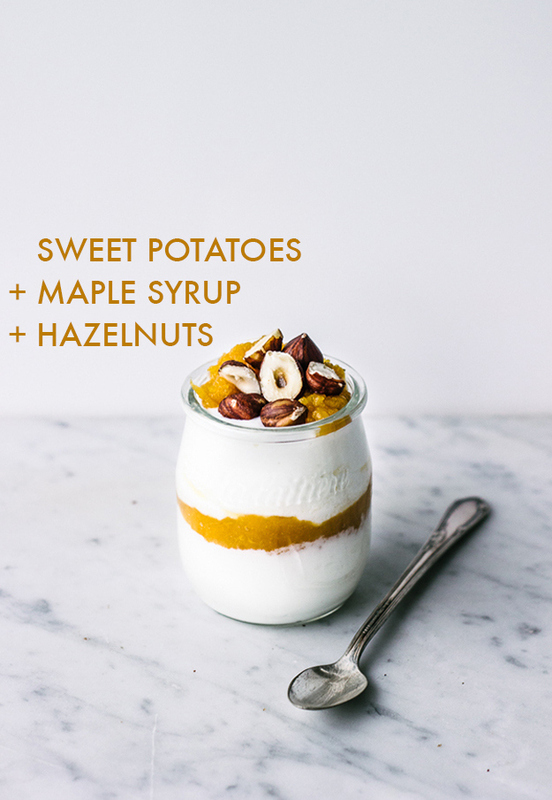 Dollop on top of yogurt and sprinkle with hazelnuts. ***Roast extra sweet potatoes to make extra potato-maple mash and then keep in the refrigerator in an airtight container to use throughout the week. Whisk together lime juice, zest, and agave. 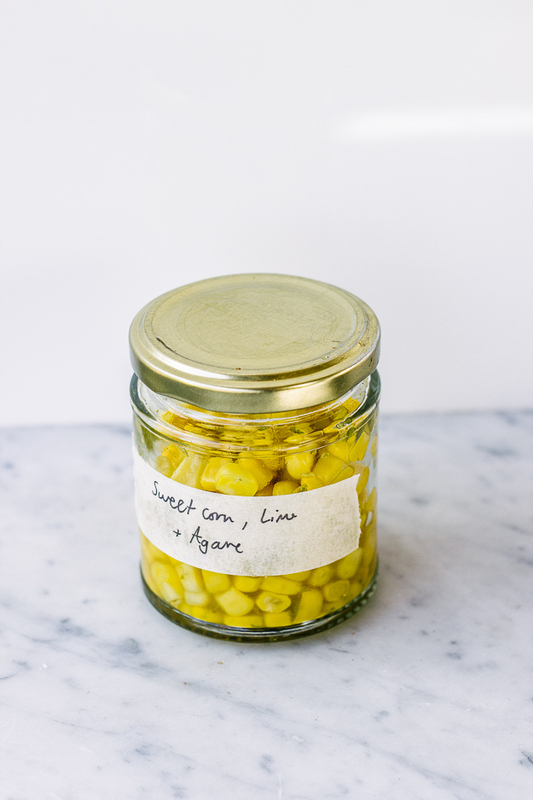 Slice fresh sweet corn kernels off the cob. 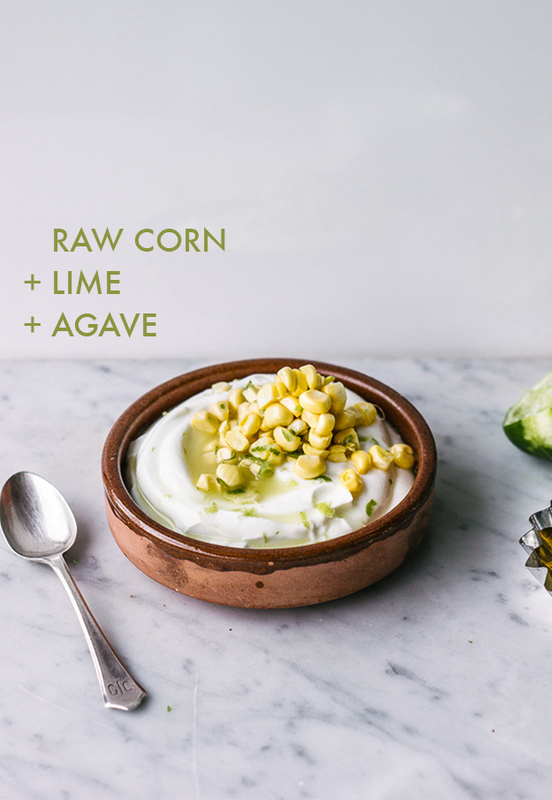 Toss with lime mixture and sprinkle over yogurt. ***Make extra topping and keep in the refrigerator in an airtight container to use throughout the week. Toast large flaked coconut in a 350°F oven until lightly browned and fragrant. Cool slightly. 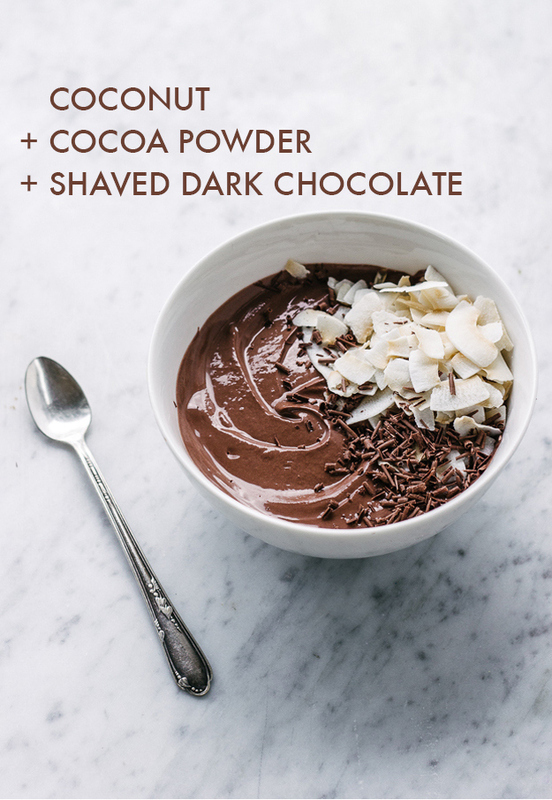 Stir cocoa powder into yogurt and top with the toasted coconut and chocolate shavings. 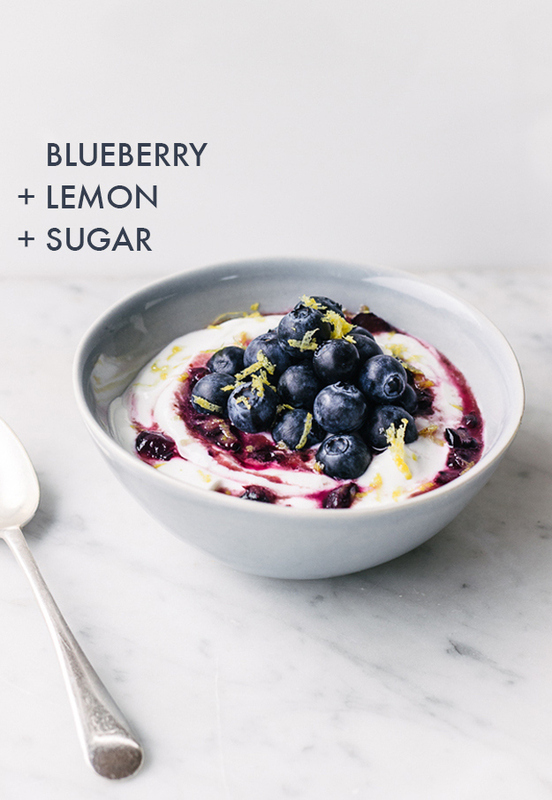 In a bowl smash together half of the blueberries with fresh lemon juice and a sprinkle of granulated sugar. Swirl gently into yogurt. Top with whole blueberries and lemon zest. 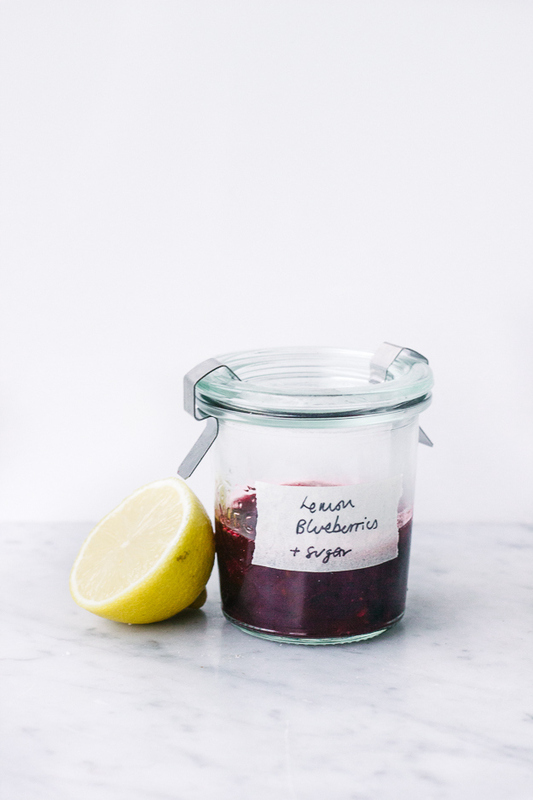 ***Make extra blueberry sauce and store in the fridge in an airtight container so you can use throughout the week. Stir vanilla extract into yogurt. Top with diced fresh strawberries. Sprinkle brown sugar and coarsely chopped pecans over top and serve. Mash banana and cinnamon together with a fork until smooth. Swirl gently into yogurt and top with finely chopped peanuts (or pecans). ***Make extra banana-cinnamon mash and store in the fridge in an airtight container so you can use for the next few days. 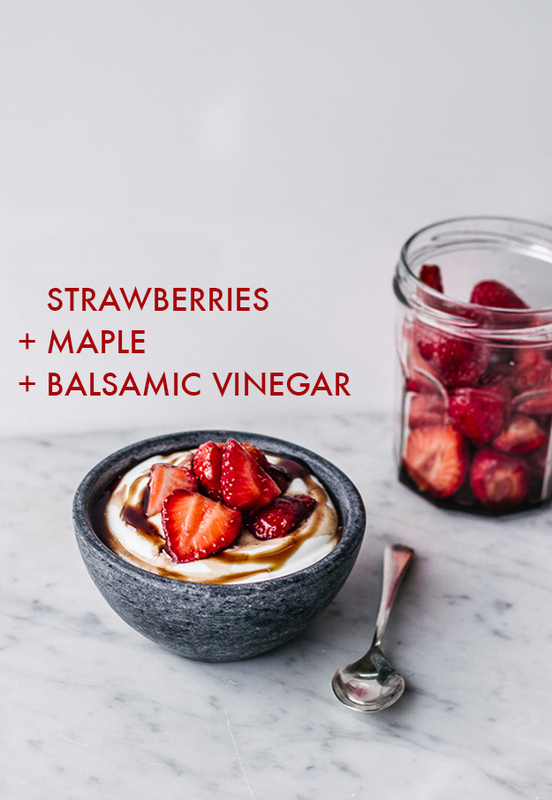 Whisk together balsamic vinegar and maple syrup in a bowl. Add the berries and set aside to macerate for 30 minutes. Spoon over yogurt. 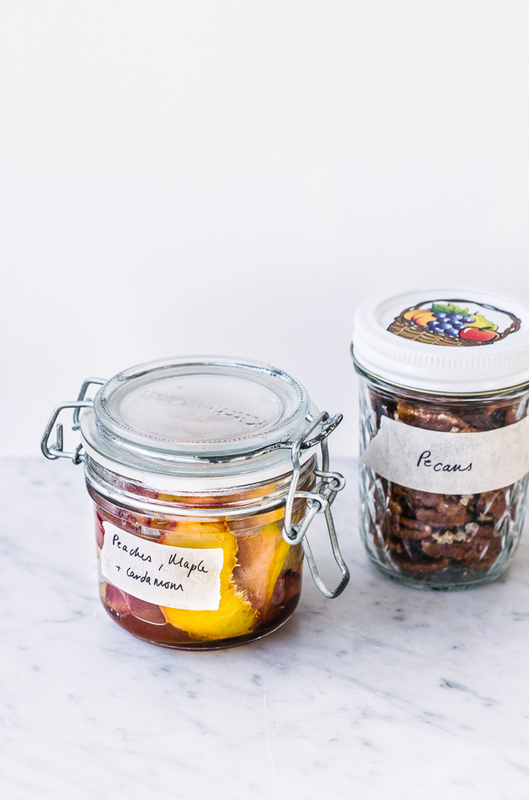 Halve fresh or dried figs. Drizzle the cut sides with honey and place, cut sides down, in a hot skillet. Caramelize for 2 minutes. 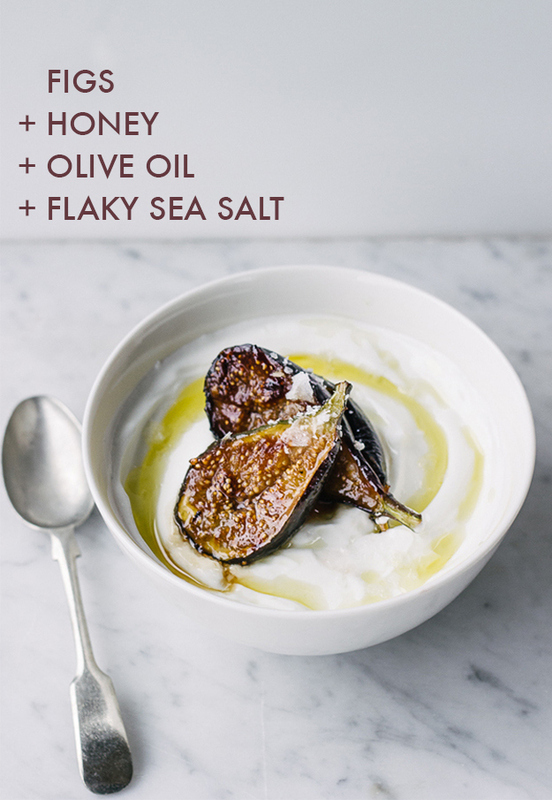 Top yogurt with figs, drizzle with olive oil and sprinkle with sea salt. 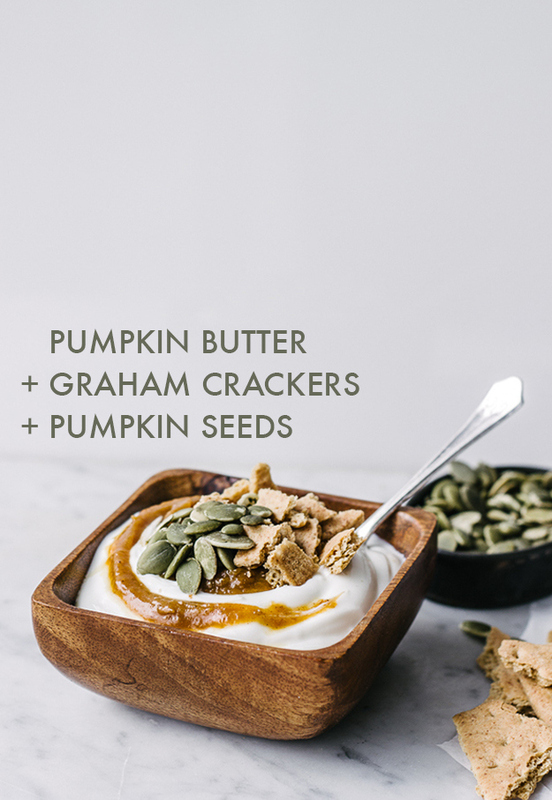 Swirl pumpkin butter into yogurt and top with shards of graham crackers and pumpkin seeds. There’s something on this list for everyone for sure. 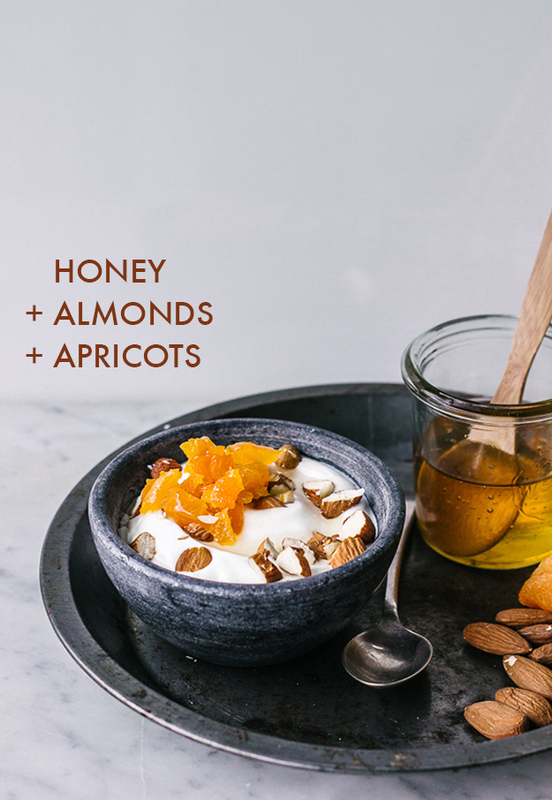 These combos aren’t just for yogurt either! 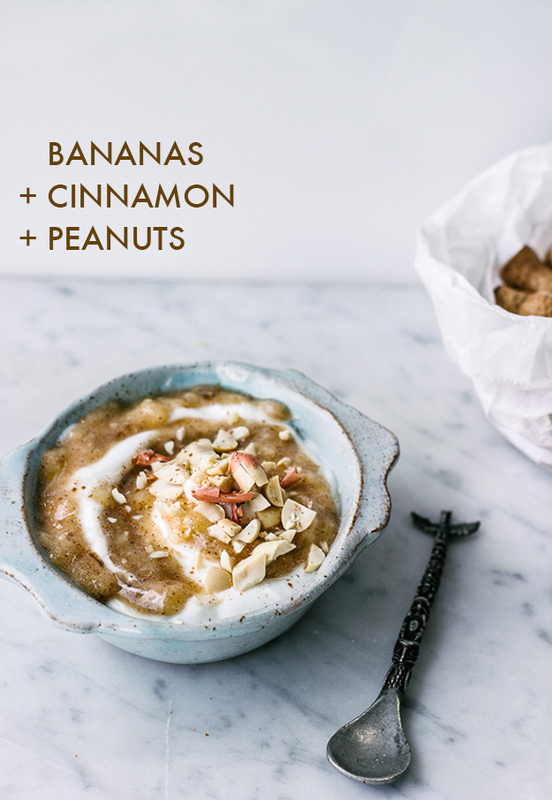 Get creative and amp up your oatmeal, waffles, or toast! If you’re more of an ice cream lover and you’re trying to stay away from all of that sugar, you absolutely must check out this 30 Days of Nice Cream series for a totally healthy and satisfying alternative to traditional ice cream!